I’m going to do it again next month, and I’d like to encourage you to consider participating in thing-a-day too. You don’t have to sign up and post on thing-a-day.com, but last year I found that it was a good motivator and fun to trade comments with other participants, and I met some great people through thing-a-day too. If you go for it, whether on thing-a-day or on your own blog, please let me know, especially if you go for a sound & music theme. I’m hoping to be able to put on a little concert with handmade instruments after the month is up– it’ll probably be March 4th in Brooklyn, so save the date if you can and I’ll have more details soon. Last November I was unexpectedly invited to show some of my music machines at Youtube Live in San Francisco. It was a whirlwind of noise and motion and I’ll try to post some photos sometime soon. Finally, I’m very excited to be working with Nick Yulman <http://nysoundworks.org/ on a permanent installation for the lobby of the newly-renovated Coney Island Museum! <http://www.coneyisland.com/> It’ll be a sound sculpture / music machine with a sideshow spirit. We hope to reveal it in the Spring! 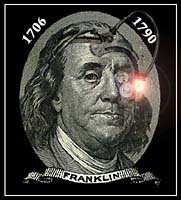 Today is Benjamin Franklin’s 303rd birthday. To celebrate, I’ve revived the Ben Franklin chatbot that Rebecca and I were commissioned to make for the Franklin Institute back in 1996.